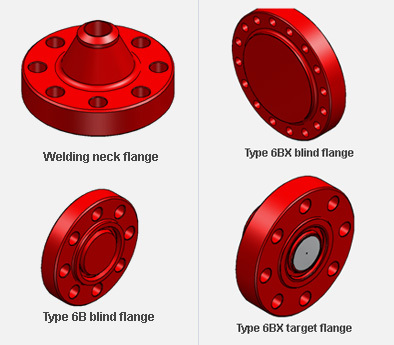 JVS manufactures weld neck flanges, blind flanges, threaded companion flanges and test flanges in various sizes & pressure ratings as per API 6A. Most common material is low alloy steel AISI 4130 or AISI 8630. AISI 410 or UNS 31803 are used for some of the critical services. Application of CRA (AISI 316L or Nickel alloy 625) enhance the corrosion resistance ability of ring groove, thus enhance the product life.